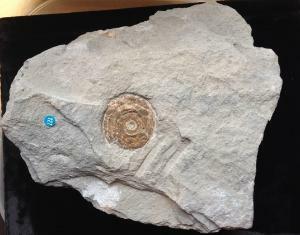 In many localities around the world, this small, rather smooth genus is taken as the marker of earliest Jurassic time. 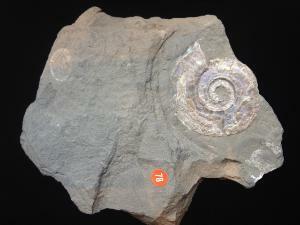 The Psiloceratidae probably evolved from the Phylloceras Ammonites and retain rather simple sutures. The preservation of original deep pink, pearly shell, crushed flat in shale, is typical of fossil shells found in north Somerset, UK. Psiloceras was a moderately capable swimmer and was abundant locally in the Early Jurassic period.